West Midlands Railway is offering an exclusive treat for mums, with free travel this Mother’s Day (31/03). 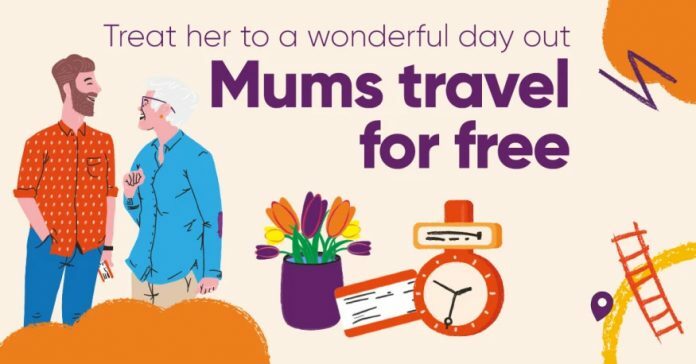 The train operator is offering a special ‘Mums Go Free’ ticket, to give complimentary train travel to mums across the West Midlands rail network. Richard Brooks, customer experience director for West Midlands Railway, said: “As a big thank you to mums, step mums and foster mums for all that they do, we’re giving them free train travel on our services for the day. This amazing treat is the perfect way to show wonderful mums just how special they are, with a day out to attractions across the region, or simply a free journey to visit loved ones on Mother’s Day. ‘Mums go Free’ tickets will be valid for travel on Sunday 31st March, and will be available to purchase from local station ticket offices in advance. Tickets will be valid on most West Midlands Railway and specified London Northwestern Railway services across the West Midlands. West Midlands Railway has also teamed up with National SEA LIFE Centre & Legoland Discovery Centre Birmingham to offer free entry for mums this Mother’s Day.